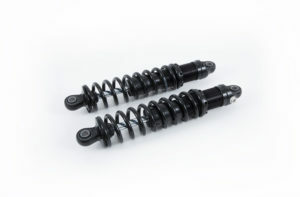 right spring and shocks, be able to handle riders and gear with suspension comfort and travel to spare. Long considered the supreme suspension supplier the world over, Ohlins is proud to offer options to put premium suspension components on to American V-twin Iron. Offering both Ohlins shock options out back and Ohlins fork cartridges for the front, we can make your Harley ride as it looks. Ohlins Suspension makes several twin shock options for Harley Davidson Motorcycles. Their Ohlins STX36 Blackline shock offering has monotube (straight) options as well as piggyback versions with different stroke lengths and damping options available. 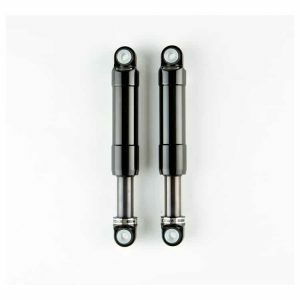 Their flat black coating, optional length adjustability, and selectable spring options make the Ohlins Blackline a fantastic option for your Harley Davidson suspension. for a standard yellow Ohlins appearance, the STX36 offers both monotube and piggyback options for most twin shock applications. Up front on Harley Davidson forks, Ohlins has several fork cartridge options to suit your ride and offer a dramatic improvement in ride quality and adjustability. Coupled with the appropriate springs for the weight of your bike and yourself, an investment here will reward you with a massive improvement in comfort and compliance. 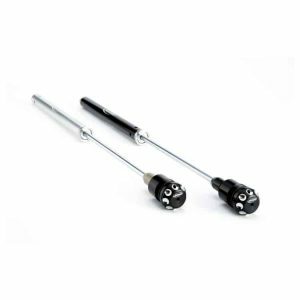 For Harley Suspension, K-Tech has brought its expertise to a whole new level for the newly released K-Tech ‘Bullit’ shocks, ‘Tracker’ front fork cartridges and ‘Razor’ shocks. Bringing over 20 years’ experience working at the highest levels in the performance suspension market place, the firm’s team of experts is making it easier than ever for Harley Davidson owners to source the high quality, high performance parts they demand. The K-Tech Bullit innovative new forged aluminum shock absorber incorporates latest damping technology along with an original look that is familiar to all Harley Davidson owners. 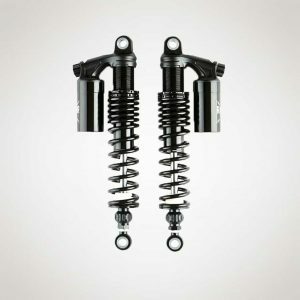 This high technology shock absorber is nitrogen charged to give consistent damping control under all riding conditions, and its spring-less design means Harley Davidson owners can take advantage of its classic “strut” type look without compromising on ride quality and comfort. There are three optional lengths available 11.5’’, 12.5’’ and 13.5’’. The K-Tech Tracker front fork cartridges are all about control, stability, and style. 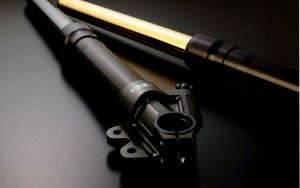 With the option of external adjustment for spring preload, compression and rebound damping, these high-performance cartridges fit into the original equipment front forks allowing the rider to adjust the forks on their motorcycle for different types of riding styles and conditions. The K-Tech Razor shocks for the Harley Davidson are a leap beyond standard equipment that lets the rider customize their own motorcycle for optimum looks and riding style. Nitrogen filled and with multiple length options, they allow up to four-way adjust-ability for refinement. 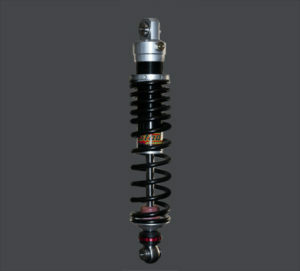 The shocks come with an anodized black finish and offers increased control and comfort over standard equipment. The K-Tech Razor shocks - Lite Version offers improved performance together with understated looks. Easy to bolt on to replace original equipment, they are a serious upgrade designed to improve a rider’s comfort and control with rebound and length adjustability. Harley Davidson riders will notice the increased performance over the standard equipment. 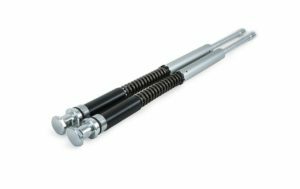 Stadium Suspension offers custom-built shocks for your OEM or modified Harley Davidson. Stadium has developed a special line of shocks exclusively for HD Suspension applications with specs and parts created only for them. These shocks can be made to a custom specific length and calibration on demand. Stadium’s Harley shocks are made from the highest quality materials, precise machining and hand assembled to specific specs. All these parts are made in North America and NOTHING PRODUCED BY STADIUM is made in China. Stadium Shocks are available for all Harley Davidson FLH, Harley V-Rod, Harley Night-Rod, Harley Sportster models and custom-made bikes. Stadium Suspension offers their 740HTR series with rebound and preload adjustability, their 740HPR1 with a piggy back mounted rezzy that offers compression, rebound, preload and ride height adjustability., and finally their 740HPR2 which adds high speed compression damping adjustment to the mix for the very discerning rider that loves to tinker. All options come with Accelerated Technologies valving and spring rate guarantee that ensures if we didn’t get your spring or damping right the first time, we make it right no charge. Stadium Suspension supplies us with a myriad of fork spring diameters (fork tube diameter dependent), rates, and lengths to match just about any application. When one end of the bike is drastically improved (a new shock), we highly recommend balancing the bike out with at least the correct springs. 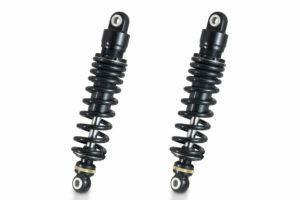 Out back, Hyperpro offers two shock options for the twin shock Harley Davidson suspension. They have the HDSP 360 line of cost effective, straight body, emulsion twin shocks custom sprung for you and your bike that are preload and rebound damping adjustable. For a greater improvement, the piggy back line of HDSP 367 line of shocks add a compression damping adjuster on the piggyback reservoir. Length options available depending on model from 11 to 14” in length. For the Harley front forks, we can install a matching set of Hyperpro progressive or straight rate fork springs depending on your ride vs performance expectations. Fill out our product request form for more information. Focusing on ride and handling, we love helping our Harley Davidson customers get the best out of their rides. Harley Suspension seems to be severely under sprung from the factory, and lets face it, it doesn’t get any better with time, the rider hoping on, or any accessories added. Keeping with the very general rule of thumb for SAGs, the bike and rider should be near the top 1/3 of the spring travel WITH the rider on board. 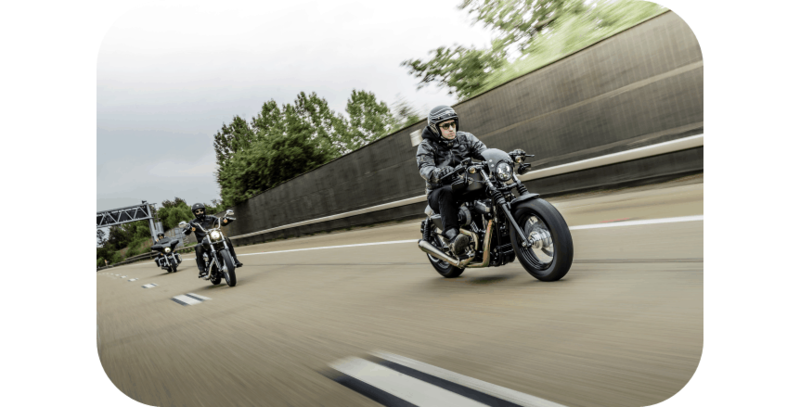 Most Harley Davidsons use up ½ the suspension travel just getting off the side stand, and then we cannot get a feeler guage between the shock and it’s bump rubber when the rider is aboard. Any bump in the road goes right into the spine at that point. 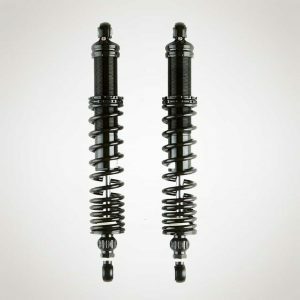 We have also replaced a ton of the problematic and non- serviceable Harley Davidson air shocks that are common out back. We can replace these with ultra high-quality coil over or Nitrogen shocks from several of our suppliers that look awesome, ride amazing, and can be adjusted for the load on the bike. We can set them soft for a low ride or raise them up when you have a load on the bike and don't want to feel every seam in the road. We match this with modifications to the Harley Forks up front to balance the bike and dramatically improve your ride. Imagine, it still looks awesome, but rides great too! Yes, you can have both. Get the setup you and your Harley Davidson deserve.